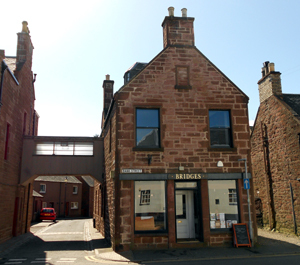 Strathmore Christian Fellowship owns the Bridges building at 42-44 Bank Street, Kirriemuir. In March 2011 Bridges Coffee House opened. This café is run by the charity Capstone Projects which gives 100% of its profits to support various projects in Uganda including a children’s home, a health centre, the building and development of a school and a coffee-growing project. Strathmore CF has worked closely with the charity over many years and several people from SCF have been out to Uganda as a result. Bridges Coffee House has built up a reputation locally as being a great place to enjoy a morning coffee & bacon roll, a lunchtime bowl of soup, or one of Dennis’ famous meringues! Even the local press agree! In August 2014 extensive stonework repairs were completed on the outside of the building largely funded by a grant from the Kirriemuir Conservation Area Restoration Scheme. In November 2017 Bridges received an extensive refurbishment of the Cafe premises giving it a brighter look inside with the same friendly staff to serve patrons.